Sometimes a cat shows up in your neighborhood or on your doorstep, and it’s obvious that the cat is feral. There’s no way you’re going to lure the cat inside or touch her, and the best you can do is feed her, and hopefully, implement Tag/Neuter/Release. 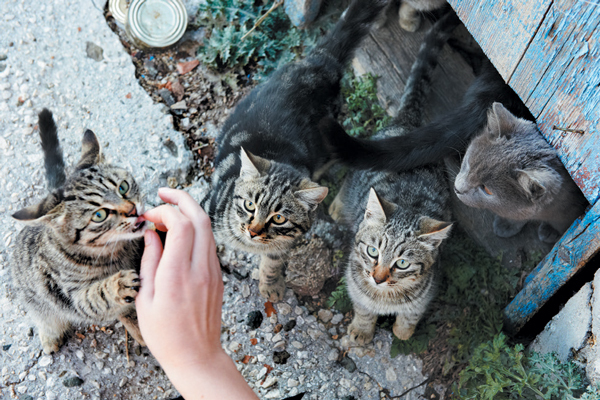 The large gray area with free-roaming cats, however, are stray cats. A stray cat may seem feral at first. But given time, you might get close to them and even tempt them inside. With time, they might make a wonderful house cat, companion, or pet for you or another good home. 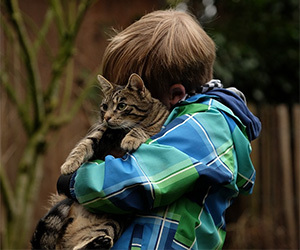 So, if it seems that a stray cat might be adopting you, what are the next best steps to take? Here’s the story of my Karma, and what she showed me about how to open your arms, and home, to a stray cat. Start by determining whether the cat is feral. I know this is easier said than done. Here’s how it played out with Karma. I began feeding her outside. Initially, she would not come close to the house at all, so I set the food on the other side of the yard, as far from the house as possible. I fed her at regular times so that she got used to the routine. Then I started to move the food closer to the house. Karma showed no reluctance to come closer, even though she would run away if I came outside while she was eating. I got to the point where the food was right inside the garage and she was still coming in and eating. But I did this over a period of several weeks and I didn’t rush it. Photography ©Dovapi | Getty Images. One day, I had a hunch that I might get her in the door. I shut all the other cats inside the house, and left the front door opened to a small enclosed breezeway we have. She came in. Somehow, I was able to close the door behind her. Did she freak? Yes, a little. But fortunately she was so hungry that she got her head temporarily stuck in a Dixie cup full of food that I had grabbed quickly. That enabled me to quickly get the other cats in the bedroom and shut that door. Then, I opened the house door. She dashed in, but again, I had a feeling she was a gentle cat — just scared. Initially she hid in a tiny utility room close near the front door. I gave her some time. I was easily able to reach in and scratch her chin. She began purring. I knew she was definitely not feral … but she could have come close to that line. Every journey with taming a stray cat will be a little different. You sometimes need to rely on your observations and your gut feeling. Does the cat seem friendly? Scared or truly wild? To me, Karma seemed scared, but not yet truly wild. She was close to feral, though, and I don’t think she would have survived long, had she turned feral or not been integrated into our household. If you succeed in getting your stray cat inside, don’t let her have any contact with your other cats (if any) until you’ve had her vaccinated, checked and tested for contagious diseases like feline leukemia. Wash your own hands if going between these cats in a multi-cat household. Photography ©Wanderer Lindsay | Getty Images. 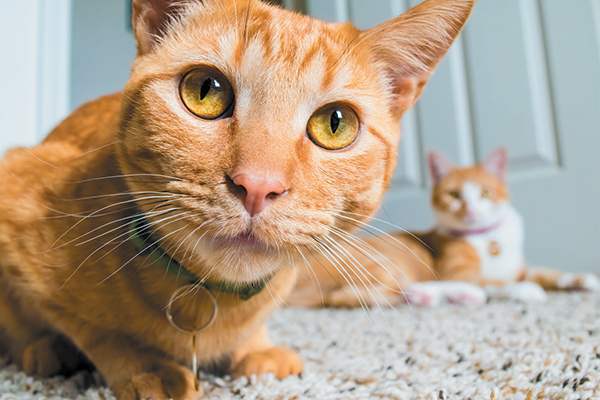 Let the cats get to know your stray cat from either side of, or under a door. Eventually, I might put the new cat in a carrier, and let the other cats take their time checking her out. I might even put other cats in carriers, and let the new cat check the house out. I might introduce her to one cat at a time, if there are several in the household. I use my intuition a lot, and this is no exception. If it feels as if it’s going really well, it may be a fast (and successful) introduction. If someone seems really bent out of shape, I’ll take my time and make sure that all the cats get some extra love during this time of transition. We can never know the baggage that a rescued stray cat may carry, but it may manifest once we get to know these newcomers better. Be ready for surprises. My cats are indoor cats, but several months after Karma’s successful integration to the household, she managed to escape outside. We almost did not get her back. Once outside, it was as if her personality changed. She became “distant,” seemed almost wild, and would not respond to us. When we were able to get her, thank goodness (we remained very calm and moved very slowly, so as not to set off more of her skittishness), we took her inside. Once inside, my husband held her up to the window (thinking that he was showing her that all was okay) and she shrank from the outside. Of course, she loves to look out windows now, but it was a strange experience. Be ready for these. Kieran, another stray who adopted me, would not look out the windows for many months, and didn’t know how to play. It was as if he needed to learn to be a carefree cat. So be ready, and patient, when some of these surprises surface. What experience have you had with stray cats that have adopted you? What have you learned, and what have you done to make the process smooth? Share your stories in comments! Article was originally published in Catster in 2015.